Sign up Early –Seriously. Early. We had hoped to apply to the Author’s Avenue… it filled up within 24 hours. Later, our group posted 4 games – all four filled up in less than an hour. As a player who was waiting several weeks for a GM badge, this meant any decent event that requires sign-up was booked. The chances of seeing Jim Butcher’s panel equaled zippo. Panels for Everyone!– Luckily, most panels & workshops have large attendance caps, no pre-reg, and are typically FREE. We caught panels on game development, marketing, young adult novels, the works… the only shame is that we couldn’t catch more. 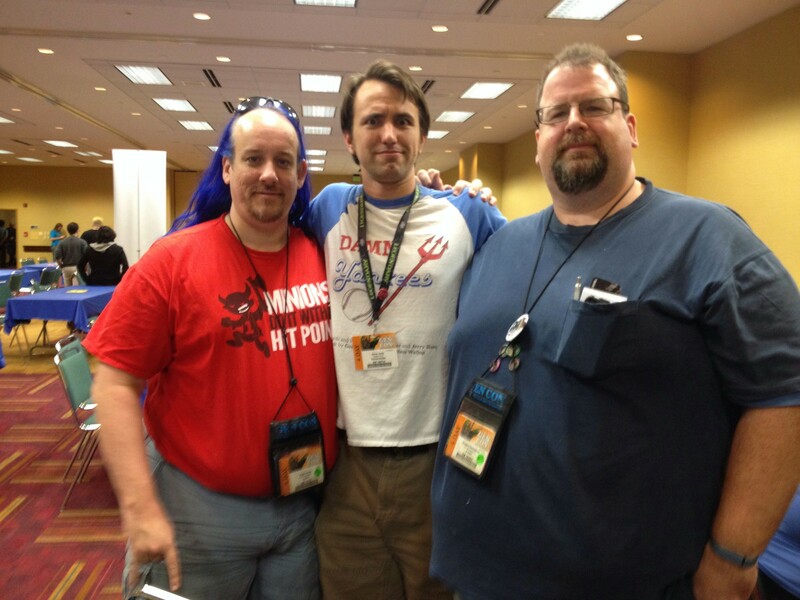 Base Camp– This was one of the first cons we’d been to where we didn’t have a booth. If you leave your car in the far-off parking garage at 7AM, what do you do with the three duffels full of stuff for the game you’re running at 3PM? Our solution? Set up a base camp! The JW Marriott, which housed a slew of RPG rooms (including all of ours), had several beautiful lounge areas, with couches, tables, etc. It became the meet-up spot for our distant members, and the place to dump our gear (admittedly, this meant that one person was stuck with the gear for long spans of time, but Rachael had coloring work on the comic, so it all worked out.) Rachael even set up a mini-booth/library: a rack with our comics out, which passersby could read for free. We weren’t allowed to sell any (which we understand), but we did hand out a few business cards. First Exposure = Intimate– When we signed up for the First Exposure Playtest Hall, we expected it to be more like a job fair – game producers and fans would stroll by your booth, and you’d pitch your product in 2 hour chunks – all flash, little substance. Instead, it was closer to the Gaming Events – you are given a group of interested players, you play a game, and ask for feedback at the end. So, while we didn’t get as much “exposure” as we had hoped (only the set number of players per session), we definitely got a chance to test the product with players who walked the perfect line between “supportive” and “ruggedly tough.” However, it was definitely worth it, and we’d definitely recommend it to anyone – the $200 package comes with 2 free tickets (a $140 value), and the First Exposure group was really supportive – they added an extra time slot just for us, their aides came around every shift asking if we needed anything, and more. When our Costume Clash game sessions ended halfway through our two-hour spot, they actively hawked the passers-by to jump in, doubling our test experience. I loved the experience, even BEFORE they sprung a surprise on me. (See Lesson 10). Games on Demand– After we had our time slots for First Exposure settled, I tried to squeeze an extra session of Skeleton Crew into Games on Demand. I sent them an email, and they sent a polite email back saying that such a request might be difficult. Internal Dave: *pompous outrage* How hard could it be to add one little game? I mean, it’s a side thing – it’s not even in the main hotel! Hindsight Dave: Yeah, “it’s going to be in the Marriott across the street” because it’s held in a massive ballroom… a room big enough to house several smaller conventions. It’s not an event, it’s a gaming MACHINE. When I finally got a free 2 hours, I popped over and saw how amazing it was – the perfect event for a guy who missed sign-up for games. Events aren’t free, but at $2 per hour, it’s damn cheap. It’s definitely a game of roulette, however. I had been hoping to play some Fate, or to get my first experience with Fiasco or Dungeon World, but my letter was one of the last to be picked, so there were only 3 two-hour games left open: a game about magical cats, a Monsterhearts game that I wanted to avoid*, and an imported Japanese game. I went with the last one and was not disappointed. In case you’re interested, it’s called Ryuutama, and plays like Final Fantasy III mixed with Oregon Trail. Would definitely recommend Games on Demand to folks, but you’ll have to keep an open mind. *I’ve never played Monsterhearts. It sounds like a great game. Part of the reason it sounds like a great game is that it sounds a LOT like Skeleton Crew. I make it a habit, while working on a project, to intentionally avoid thematically similar projects because: A) in the unlikely event that someone tries to sue us for copyright infringement, I can claim full ignorance of the supposedly stolen product. B) I won’t stumble across an awesome mechanic and want to steal it, and C) I won’t stumble across an awesome mechanic and subconsciously steal it. GM Badge – Pros & Cons– GMing is a great way to get a free badge to the event; but as mentioned above, if you’re waiting for them to give you the badge before you buy event tickets, most of the good events will be taken. If you’re GMing for no purpose but to have fun and save money, 4-hour sessions are a fast way to rack up hours. Prep a large event with 6-7 players, and in no time, you’ll have a free badge – if you wrap up in 3:30, most people won’t mind. However, if you’re trying to promote a product, 2-hour sessions are best – you’ll get in twice as many potential customers. Make them tight, well-practiced games with pre-generated characters, and 5-6 players max. It means a bit more work, but the Event staff is accommodating – we ran two 2-hour sessions for the same game, and the coordinators nicely put them back-to-back on the same table, so I didn’t even need to pack up in-between. Another recommendation I’d give is that you laminate the character sheets and give the players dry erase markers – they can mark it up all they want, and then wipe it clean for the next group. Exhibit Hall-y CRAP That’s Big– Not much to say about the Exhibit Hall, other than expect to spend more than one afternoon going through it. Our group skimmed through, just looking for consignment houses and small press booths, and it took us 3.5 hours. 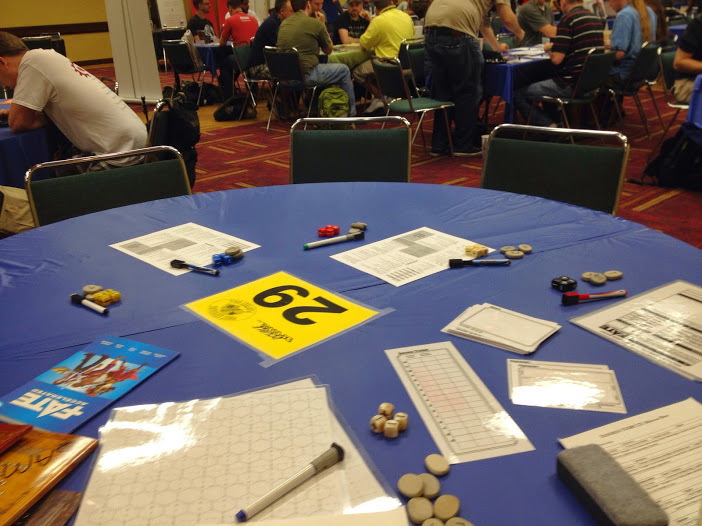 Board Gamers Aren’t Boring– I jumped in on many playtests with tons of strangers with whom I had no connection save the game in front of us and the folding chairs beneath us. In every case, people were friendly, engaging, and fun. I have a term when you can bond with fellow geeks in a moment: I call it “Nerds of a Feather.” I’m a fairly optimistic person, and I love the many Kingdoms of Fandom, but compared to the other cons I’ve frequented, the friendly energy was in abundance. So what made this different? My theory: these are card and board gamers. While some play video games, they prefer to play games that involve other humans, face to face. Designer People Are Just the Same as You and I– Most of the big wig game writers and designers I happened to see at panels were smart, brilliant… and seemed like Average Joes. They were completely ordinary… until you got them talking about games, and then the energy came pouring out of them. I’ve been to a few cons with famous voice actors, and while they try to come across as average, they’re not quite – as a former actor, I know: you do it for the attention. Even authors can talk haughtily of their work – like it or love it, they know that novel is theirs. But with a game, I think the rules might be different – an RPG author doesn’t write the game for himself; he writes it for others. Think of it this way: if a designer writes an RPG in the woods, and no one is around to run it, is it still an RPG? Of course, it’s easy to say how designers look when they’re up at a podium. Well, two star designers gave me the honor of joining me on Sunday. For my last Skeleton Crew session, I was running a game of Fate Core for Fred Hicks and Rob Donahue – I know First Exposure Playtest Hall had a hand in finding or scheduling for them, and I can’t thank them enough. Fred & Rob were as friendly and down-to-earth as could be. I think. I don’t quite remember, I think I was hyperventilating. Details next week.